Remember this guy? 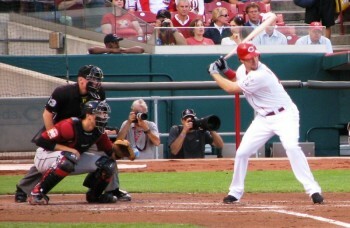 This is a fella called Ryan Ludwick. He’s on the ASG ballot for the Reds. The Reds sent me an email this weekend to let me know that Joey Votto and Brandon Phillips are currently the leading All Star Game vote-getters in the NL for their positions. At that time, Votto had 1,569,477 votes. Who’s in second and how much does he trail by? The email didn’t go into that kind of detail. For the first time ever, All-Star Game balloting updates will be revealed live on television over the weekend, as part of MLB national broadcasts on FOX and ESPN. This Saturday, June 8th, and next Saturday, June 15th, FOX will exclusively reveal updated voting totals for the American League starters as part of its “Baseball Night in America” pre-game show at 7:00 p.m. ET before its slate of prime time games begins. This Sunday, June 9th, and next Sunday, June 16th, ESPN will exclusively reveal updated voting totals for the National League starters during “Baseball Tonight” at 7:00 p.m. ET prior to its Sunday Night Baseball telecast. Well that explains it. They’re not going to give away information for free online when they want to force you to watch FOX and ESPN for it. I’m only surprised that they didn’t put it on MLB Network. I didn’t catch the numbers last weekend, and I probably won’t next weekend either, but I can guess that Votto is leading his spot by a wide margin. The Reds know that you can motivate this fan base to vote in mass quantities with a close race. It follows that a landslide victory will cause fans to shrug and figure the All Star situation is taken care of, so they’d want to keep a big lead quiet. On the other hand, they did give the numbers for Phillips. At that time he had 1,541,720 and was leading the Giants’ Marco Scutaro’s 1,285,076. While not a for-sure lead, that’s not exactly the kind of challenge that Reds fans took on to get Votto in as the 25th man a couple years ago. Maybe we should aim for something a little less likely. See if we can get Ryan Ludwick voted in. He ought to be just about off the DL by then.